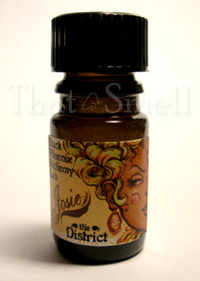 Josie is a member of Black Phoenix Alchemy Lab’s District line of fragrances that focus on the sensual side of smell. Josie, in my case, hits a nice little sweet spot I have for peach notes. In Bottle: Strong. I mean, up your nose and clear out your sinuses strong. Josie is a heavy handed dose of sweet peach candy with a dollop of honey and a light dusting of sweet magnolia flowers. Yikes. Applied: This fragrance is no wilting flower. It’s loud on application and remains loud until a few hours in. Your first impression of Josie is likely to be her very sugary personality that plays up the honeyed peach angle. If you aren’t partial to sugar, you might want to consider a difference fragrance because this stuff can be cloying. It dries down to a finer peach with a little less overbearing sweetness as the magnolia makes faint efforts to make itself present but don’t go digging into Josie looking for florals, she’s peach candy and honey for most of the ride. If you’re looking for something like a refreshing peach, you may have to look elsewhere. If you just want sweet peach candy then Josie should be up your alley. Extra: I do like Josie, or at least like her concept of a simple sweet peachy fragrance. But she is very sweet and a bit too young for me now. If you liked Katie Perry’s Purr fragrance but wanted even more peachy goodness then give BPAL’s Josie a sniff. Design: Bottled in a similar manner to BPAL’s other fragrances. You will get an amber colored glass vial with a plastic stopper. The label for Josie differs a bit from the other BPAL fragrances as it features artwork by the very talented, Molly Crabapple. Ultimately, Josie falls a bit flat on me because she’s just too sweet and I expected her to have a bit more temperance. Still, whenever I see someone ask for a peach fragrance I’m tempted to tell them to smell this. Reviewed in This Post: Josie, 2010, 5ml Bottle. This entry was posted in black phoenix, fruity, Reviews By House, sweet and tagged honey, magnolia, peach. Bookmark the permalink.